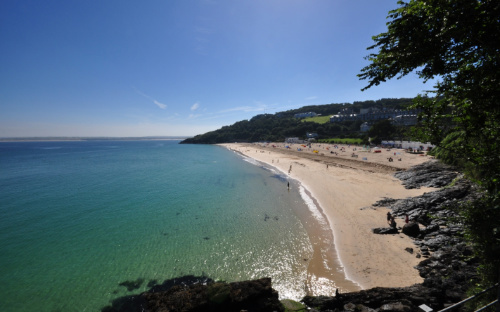 The long, sandy beach of Porthminster, with its calm, blue waters, is located just below the railway station at St Ives, Cornwall, and has found favour since the late nineteenth century as a resort, especially after the retirement of its seine fishing fleet. However, its history stretches back much further than this, with its present-day sands and landscaped green areas said to conceal the buried remains of a medieval chapel and village that once stood below the cliffs here through until the fifteenth century. 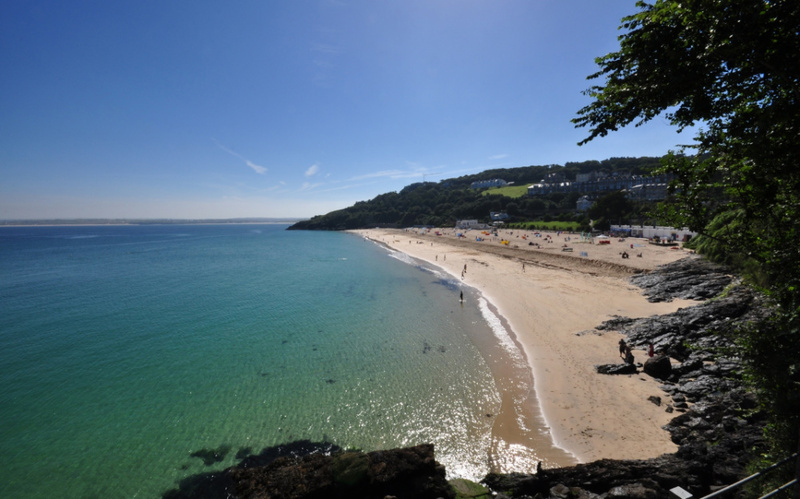 Porthminster Beach, St Ives; click here for a larger version of this image (image: Robin Stevens, CC BY-NC-ND 2.0). 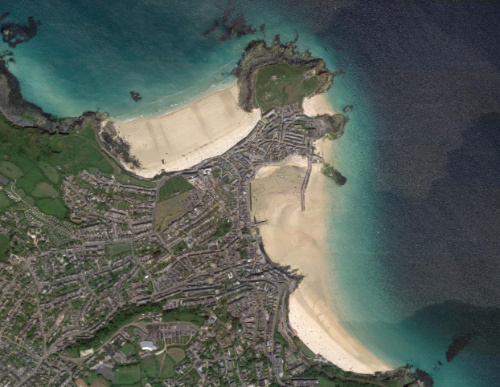 An aerial view of St Ives and its beaches; the north-western beach is Porthmeor and the southern beach is Porthminster, with the town and the harbour between the two, shown here at low tide when it is dry. Click here for a larger version of this image or here for a zoomable version (Imagery © 2018 Google, TerraMetrics, Data SIO, NOAA, U.S. Navy, NGA, GEBCO, Map data © 2018 Google, used in accordance with their attribution guidelines). Porthminster beach, St Ives, in 1845; click here for an uncropped version of this image (image: PD, via the BSJW Trust). 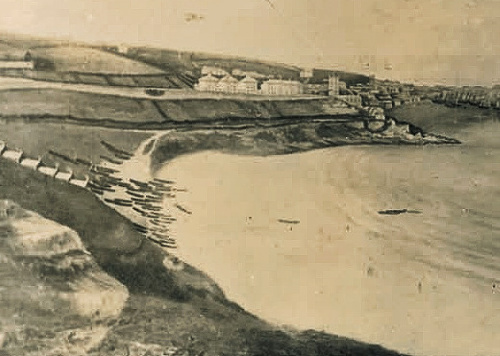 Porthminster beach, St Ives, c. 1890–1900; click here for a larger version of this image and here for the uncropped version. The Tregenna stream can be seen as a darker line in the sand on the left of the image, coming down from the higher ground before apparently disappearing into the beach (image: Wikimedia Commons/Library of Congress). 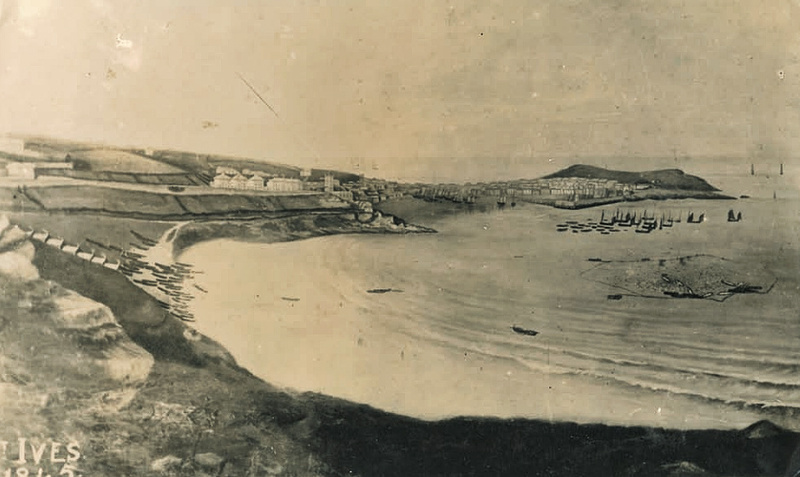 Porthminster beach, St Ives, on am OS map surveyed in 1877 and printed in 1887; click here for a larger version of this image (image: National Library of Scotland, 2017). Porthminster beach in 2018 and 1877, with the outline of the modern features transposed onto the 1877 map; click here for a larger version of this image (Left: Imagery © 2018 Google, Map data © 2018 Google, used in accordance with their attribution guidelines; Right: National Library of Scotland, 2017). Taken together, these two accounts suggest that the remains were exposed on the upper part of the current beach or the immediately adjacent areas to its rear, rather than on the higher parts closer to the railway viaduct. First, it is said that the Tregenna stream 'loses itself in the sands of Porthminster, near the foundations of an ancient chapel'. This description can perhaps be equated with the depiction of the stream on the photograph of c. 1890–1900, where the Tregenna stream can be seen emerging from the area of seine boats and then disappearing on the beach, with other early photographs showing a similar situation. 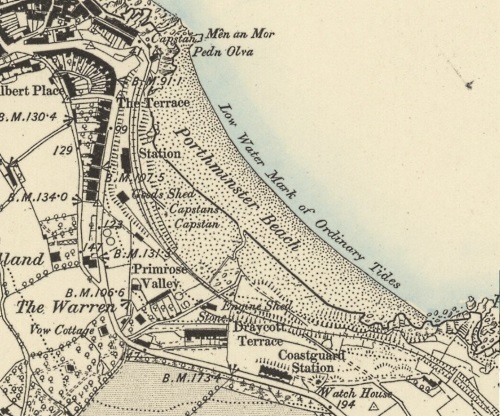 It is also arguably supported by the OS map surveyed in 1877, above, which shows a straight course for the stream through until just after the current promenade in front of the putting green, when it adopts a more sinuous course. Whatever the case may be, the description would seem to imply a findspot at or close to the top of the current beach for the chapel remains. Second, Matthews' 1884 comment that 'after high tides, when the sand has been washed down by big waves, the foundations of the church are uncovered for a time', obviously indicates a location that was both normally covered by sand and in an area that the highest tides could reach and temporarily expose before it became covered up by sand once more, rather than it being located well beyond the high tide line in the area of the putting green/former seine boat mooring area towards the railway viaduct. 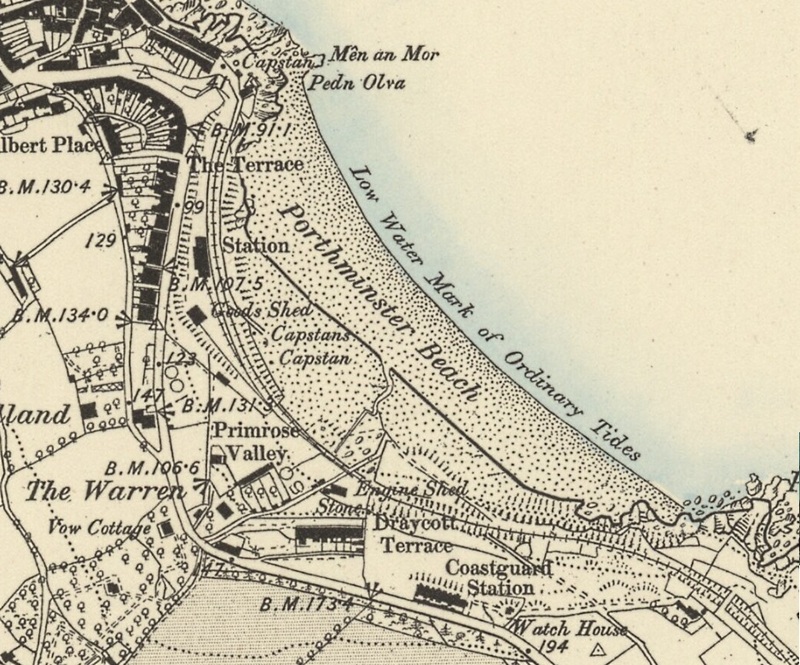 As to where the highest tides reached in the later nineteenth century, this clearly varied just as it does today—the 1877 OS map, for example, places the median high tide line some distance from the current promenade, around halfway down the beach, but 1930s OS maps and the photograph of c. 1890–1900 show it much closer to the promenade, a little way short of where the present-day beach shop and chalets now are sited. Once again, whatever the case may be, the description would nonetheless seem to imply a location for the remains as being both under sand and in the area at or close to the top end of the present beach. The Porthminster beach shop and chalets (right, with multi-coloured doors) and the Porthminster Beach Café (on the left); the beach-front promenade runs between the putting green and the beach and behind the beach shop/chalets. 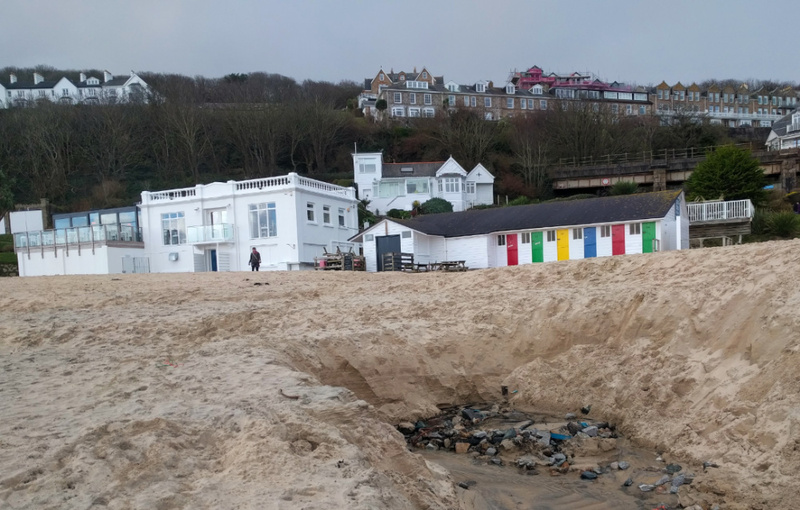 Note, the Treganna stream is also present in the foreground, where it has re-emerged in the centre of the beach on its former alignment after apparently breaking its culvert in the winter of 2017–18; click here for a larger version of this photograph (image: C. R. Green). Whether the chapel itself was purely 'full medieval' or had earlier origins/phases is, of course, uncertain, in the absence of solid archaeological or documentary evidence. On the one hand, whilst the chapel was presumably in existence before 1301, when the name 'Porthminster' is apparently first recorded, if 'Porthminster' does indeed refer to it then the somewhat curious presence of the English loanword mynster, 'endowed church' (< Latin monasterium), in the name might suggest a late foundation for the site and a possibly monastic character. (12) On the other hand, Imogen Tompsett has considered the Porthminster find to be a potential early medieval chapel/oratory site in her recent survey of the evidence from the South-West. (13) Certainly, it wouldn't be the only example of a buried early medieval chapel along the coast of Cornwall. For example, the so-called St Gothian’s Oratory ('the chapel in the sands') at Gwithian, St Ives Bay, was uncovered in 1827 and visible as a ruin until the early twentieth century before it was re-engulfed, and this seems to have been a small tenth-century church that was abandoned to the blowing sand after c. 1200, with a sequence of finds that could extend back as far as c. AD 700. Likewise, the well-known site of St Piran's Oratory near Perranporth—a probably tenth- to twelfth-century building with a likely unexcavated eighth-/ninth-century stage given the radiocarbon dates obtained from burials recently found there—was largely swallowed by shifting sand dunes sometime during the medieval period before being occasionally re-exposed and then partially excavated in 1835 and 1843 (it was reburied to protect it in 1980), and a potentially early chapel was uncovered underneath the sands of Lelant Towans in 1875 during the building of the railway link to St Ives. (14) However, given the sparseness of the documentation and the apparently late place-name and burials at Porthminster, such a possibility cannot be pushed too far at present. 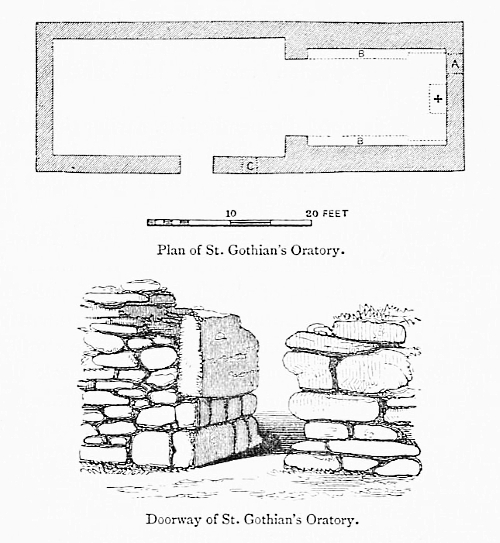 Plan and drawing of the tenth-century St Gothian's Oratory, Gwithian, from J. T. Blight, Churches of West Cornwall (London, 1885), pp. 138–39; see C. Thomas, Gwithian: Notes on the Church, Parish and St Gothian’s Chapel (Gwithian, 1964), for a slightly more accurate plan of the oratory and a conjectural section based on earlier accounts (image: Internet Archive). 1. John Leland, Itinerary, iii.21, quoted in J. H. Matthews, A History of the Parishes of Saint Ives, Lelant, Towednack and Zennor (London, 1892), p. 48, and K. Newell, Cornwall and Scilly Urban Survey. Historic Characterisation for Regeneration: St Ives, HES Report no. 2005R069 (Truro, 2005), p. 19; note, I have modernised the spelling here. 2. C. S. Gilbert, An Historical Survey of the County of Cornwall (Plymouth, 1817–20), vol 2, part 2, p. 710. 3. See J. Smeaton, Reports of the Late John Smeaton, F.R.S., 2nd edn. (London, 1837), pp. 199–204 at pp. 201–02 and plate 17. The retaining sea-wall at Porthmeor was apparently completed by 1782, see Cornwall & Scilly Historic Environment Record no. MCO56020. 4. C. Noall, 'Nineteenth-Century discoveries at Lelant', Cornish Archaeology, 3 (1964), 34–6, who gives details of the inundation of Lelant and mentions that of Phillack; D. Gilbert, The Parochial History of Cornwall (London, 1838), vol 3, pp. 5–6 (Lelant) and pp. 339–40 (Phillack). 5. C. Thomas, 'Minor sites in the Gwithian area (Iron Age to recent times)', Cornish Archaeology, 3 (1964), 37–62 at pp. 52–3; D. Gilbert, The Parochial History of Cornwall (London, 1838), vol 2, pp. 149–50. 6. J. H. Matthews, A History of the Parishes of Saint Ives, Lelant, Towednack and Zennor (London, 1892), p. 36; O. J. Padel, Cornish Place-Name Elements (Nottingham, 1985), pp. 167, 300; O. J. Padel, A Popular Dictionary of Cornish Place-Names (Penzance, 1988), pp. 194, 200; Cornwall & Scilly Historic Environment Record nos. 29909 & 29909.01. 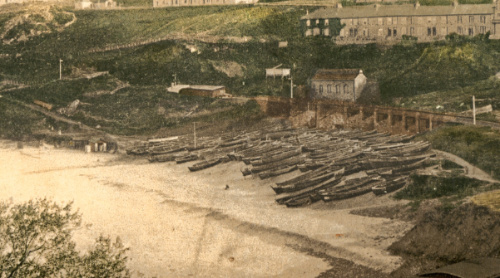 Note, the South West Coast Path's St Ives Station–Carbis Bay walk guide, online at https://www.southwestcoastpath.org.uk/print-walk/471/, claims that 'Around 1875, the construction work on the railway line unearthed a number of shallow graves in the sand at Porthminster, followed by the discovery of several stone-built cists, buried more deeply. Nearby was a primitive building, thought to be an oratory or chapel.' This appears to be a mistaken application of the Lelant Towans finds of Spring 1875 to Porthminster beach, however, as it fits the description of the former exactly both in terms of finds and date (see C. Noall, 'Nineteenth-Century discoveries at Lelant', Cornish Archaeology, 3 (1964), 34–6), whilst differing significantly from all other accounts of the Porthminster finds. 7. J. H. Matthews, A History of the Parishes of Saint Ives, Lelant, Towednack and Zennor (London, 1892), p. 2. 8. J. H. Matthews, A Guide to St. Ives and its Surroundings (St Ives, 1884). 9. Transcribed in C. S. Gilbert, An Historical Survey of the County of Cornwall (Plymouth, 1817–20), vol 2, part 2, pp. 710–11; J. H. Matthews, A History of the Parishes of Saint Ives, Lelant, Towednack and Zennor (London, 1892), pp. 36, 47. See footnote 12, below, for some fourteenth- and fifteenth-century references to the settlement of Porthmenstre (Porthminster). 10. W. Page (ed. ), Victoria History of the County of Cornwall (London, 1906), p. 484. Of course, an unrecorded mid-fifteenth-century event is by no means impossible: Fowey was certainly burnt in 1457 (see Page, Victoria History of Cornwall, p. 483), and a fortification was moreover built at St Ives in 1490, just to the east of the medieval pier and quay—known as the 'Castle', elements of it may survive in Quay House on the harbour front, see K. Newell, Cornwall and Scilly Urban Survey. Historic Characterisation for Regeneration: St Ives, HES Report no. 2005R069 (Truro, 2005), p. 18). 11. S. M. Pearce, South-western Britain in the Early Middle Ages (London, 2004), pp. 102–03. 12. As noted in K. Newell, Cornwall and Scilly Urban Survey. Historic Characterisation for Regeneration: St Ives, HES Report no. 2005R069 (Truro, 2005), p. 15, and Pastscape Monument no. 424926. Cornwall & Scilly Historic Environment Record no. 29909 notes that the name Porthminster is first recorded in 1301 and it furthermore occurs in the name Walto Porthmaystre, Walter of Porthminster, in 1327 (J. H. Matthews, A History of the Parishes of Saint Ives, Lelant, Towednack and Zennor (London, 1892), p. 49). In 1362–3 it is found as Porthmenstre in the context of a writ of April of that year directing the Sheriff of Cornwall to restore property in a number of settlements, including Porthmenstre, to Henry son of Richard Trewennard and Richard Tyrel and Rose his wife (H. C. Maxwell Lyte (ed. ), A Descriptive Catalogue of Ancient Deeds: Volume 4 (London, 1902), deed A. 10422 at p. 555), and it is mentioned again as Porthmenster in 1375 (H. C. Maxwell Lyte (ed. ), A Descriptive Catalogue of Ancient Deeds: Volume 5 (London, 1906), deed A. 12086 at p. 240, cross-referenced to deed A. 10422). Other instances include a William Porthmynster who appears in the Penwith Hundred Court Roll for 1486–7 for assaulting William Bolenov 'with force of arms, namely with sword and stones, beat, wounded and maltreated him, in breach of the king's peace' (CRO AR/2/101/1); a Vivian Aunger of Porthmynster, 'fyssher', who appears alongside a Henry Aunger of Porthia [St Ives], 'fyssher', in 1433 (Calendar of Close Rolls, Henry VI: Volume 2, 1429-1435 (London, 1933), p. 287); and a reference to 'lands, &c. in the Gewe of Porthmynster' in 1483 (Lyte (ed. ), Descriptive Catalogue of Ancient Deeds: Volume 4, deed A. 10054 at p. 500). For the meanings of minster/mynster in Middle English, see S. M. Kuhn (ed. ), Middle English Dictionary (Ann Arbor, 1977), pp. 508–09. 13. I. Tompsett, Social Dynamics in South-West England AD 350–1150: An Exploration of Maritime Oriented Identity in the Atlantic Approaches and Western Channel Region (University of Nottingham PhD Thesis, 2012), pp. 126 (fig. 40), 128 (fig. 42), 379. On the name 'Porthminster', see Cornwall & Scilly Historic Environment Record no. 29909; O. J. Padel, Cornish Place-Name Elements (Nottingham, 1985), pp. 167, 300; O. J. Padel, A Popular Dictionary of Cornish Place-Names (Penzance, 1988), pp. 194, 200. 14. St Gothian's Oratory: J. A. Nowakowski et al, 'Return to Gwithian: shifting the sands of time', Cornish Archaeology, 46 (2007), 13–76 at p. 58; A. Preston-Jones & N. Thomas, St Gothian's Oratory, Gwithian, Cornwall: Survey and Fencing, CAU report no. 2001022 (Truro, 2002); C. Thomas, Gwithian: Notes on the Church, Parish and St Gothian’s Chapel (Gwithian, 1964). St Piran's Oratory: I. Tompsett, Social Dynamics in South-West England AD 350–1150: An Exploration of Maritime Oriented Identity in the Atlantic Approaches and Western Channel Region (University of Nottingham PhD Thesis, 2012), pp. 126 (fig. 40), 133, 334; S. Turner, Making a Christian Landscape: How Christianity Shaped the Countryside in Early-Medieval Cornwall, Devon and Wessex (Exeter, 2006), pp. 38, 49; D. Cole & J. Gossip, St Piran's Oratory, Perranzabuloe, Cornwall: Results of Evaluation, CAU report no. 2010R140 (Truro, 2010); J. Gossip, 'Dark Age skeletons found at Cornish chapel were early Christian children and women who could have been from same family', Culture24, 20 August 2015, online article. Lelant Towans: I. Tompsett, Social Dynamics in South-West England AD 350–1150: An Exploration of Maritime Oriented Identity in the Atlantic Approaches and Western Channel Region (University of Nottingham PhD Thesis, 2012), pp. 134 (fig. 45), 375 (fig. 201), and 379–81; C. Noall, 'Nineteenth-Century discoveries at Lelant', Cornish Archaeology, 3 (1964), 34–6; Cornwall & Sicily Historic Environment Record no. 31061; C. Thomas, And Shall These Mute Stones Speak? Post-Roman Inscriptions in Western Britain (Cardiff 1994), p. 198, fig. 12.1. The focus of the current post is an unusual find of Barbary ape remains from a fifth- or sixth-century AD context at Wroxeter (Shropshire), once the fourth largest city in Roman Britain. The Barbary ape, or more properly the Barbary macaque, is primarily a North African species of monkey, but the Wroxeter find forms part of a small body of archaeological evidence for their presence as exotic pets and imported curiosities in Iron Age, Roman and medieval Europe, with a significant proportion of these finds actually coming from Britain and Ireland. Finds of North African Barbary ape remains from Iron Age, Roman and medieval Europe; click here for a larger version of this map. 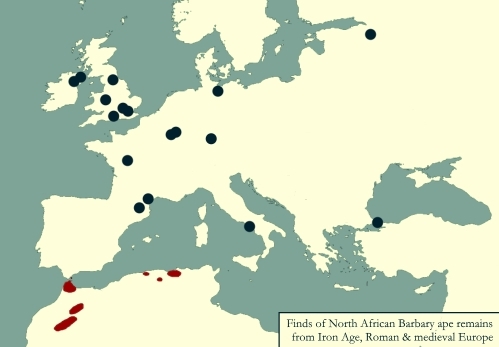 Archaeological excavations producing Barbary ape remains are shown by dark blue dots whilst the modern-day range of Barbary apes is shown in dark red (image: C. R. Green, based on a base map from Wikimedia Commons). Barbary macaques (Macaca sylvanus), commonly known as Barbary apes, are a species of Old World monkey indigenous to North Africa whose range in antiquity is thought to have extended from the Atlas Mountains of Morocco and Algeria across into what is now Tunisia and western Libya, with the small European colony on the Rock of Gibraltar probably established by the eighth century AD but potentially not much earlier than this (it is not mentioned by the classical authorities who discuss the Rock). As such, the presence of Barbary ape remains in 'post-Roman' Wroxeter, Shropshire, is certainly intriguing. 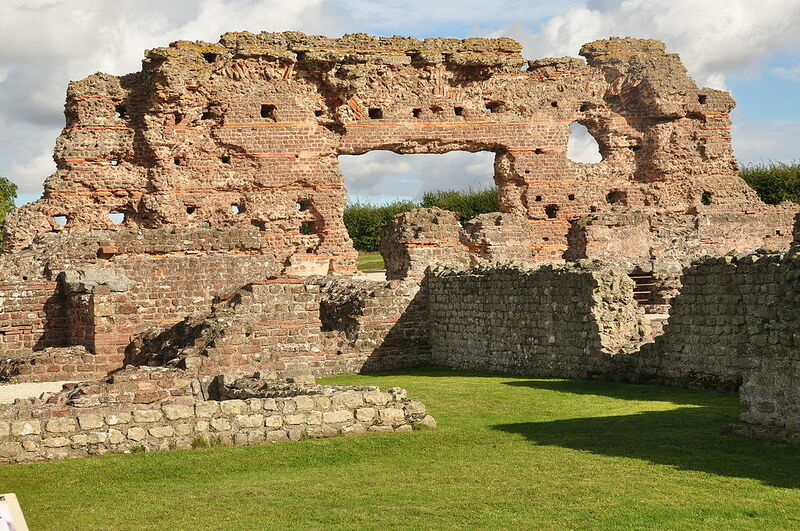 The remains of the 'Old Work', part of the baths basilica complex at Viroconium Cornoviorum (Wroxeter); this surviving 7 metre high wall and arch is the largest piece of free-standing Roman wall in Britain (image: Nilfanion/Wikimedia Commons). 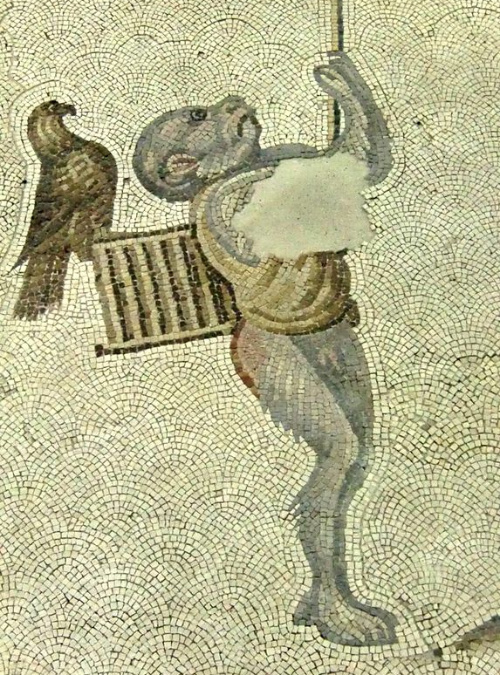 An Early Byzantine mosaic of a Barbary ape from the Great Palace of Constantinople, usually dated to the sixth century AD (image: Laurom/Wikimedia Commons). 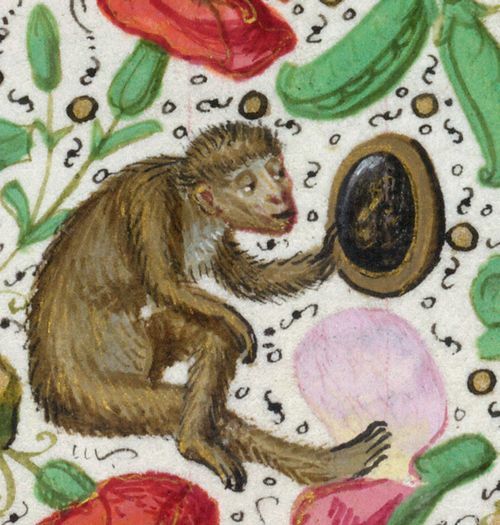 A Barbary ape looking at itself in a mirror, from the fifthteenth-century Isabella Breviary, BL Additional 18851, f. 270r, made in the Southern Netherlands; for some more examples of medieval illuminations of monkeys, see this blog from the British Library (image: British Library). 1. A. J. Hammon, Late Romano-British – Early Medieval Socio-Economic and Cultural Change: Analysis of the Mammal and Bird Bone Assemblages from the Roman city of Viroconium Cornoviorum, Shropshire (University of Sheffield PhD Thesis, 2005), vol. 1, pp. 152–3; A. Hammon, 'Understanding the Romano-British–Early Medieval transition: a zooarchaeological perspective from Wroxeter (Viroconium Cornoviorum)', Britannia, 42 (2011), 275–305 at pp. 290, 298; P. Barker et al, The Baths Basilica Wroxeter: Excavations 1966–90 (London, 1997), p. 358. 2. P. Barker et al, The Baths Basilica Wroxeter: Excavations 1966–90 (London, 1997); M. Fulford, 'Wroxeter: legionary fortress, baths, and the "great rebuilding" of c. AD 450–550'. Journal of Roman Archaeology, 15 (2002), 639–45; A. Lane, 'Wroxeter and the end of Roman Britain', Antiquity, 88 (2014), 501–515. Note, Lane's argument that Barker's interpretation of Wroxeter as a continuing Roman town stands alone and without parallel in post-Roman Britain fails to take into account the evidence from Lincoln, where continued use of the Roman forum area into the sixth-century AD is now well-established, see especially Green, Britons and Anglo-Saxons: Lincolnshire AD 400–650 (Lincoln, 2012), pp. 65–9, 82–3, and Green, 'The British kingdom of Lindsey', Cambrian Medieval Celtic Studies, 56 (2008), 1–43 at pp. 18–23, and the summary discussions in Green, 'The fifth-to sixth-century British church in the forum at Lincoln: a brief discussion', blog post, 11 December 2017, online at http://www.caitlingreen.org/2017/12/fifth-to-sixth-century-british-church-lincoln.html, and Green, 'Romano-British pottery in the fifth- to sixth-century Lincoln region', blog post, 12 June 2016, online at http://www.caitlingreen.org/2016/06/romano-british-pottery-fifth-century-lincoln.html. 3. On the radiocarbon dates still implying post-Roman activity, see A. Lane, 'Wroxeter and the end of Roman Britain', Antiquity, 88 (2014), 501–515 at pp. 508, 513; he also mentions the coin and inscription as still indicative of post-Roman activity (p. 511), but doesn't refer to the amphorae sherds. On Palestinian ('Gaza') LR4 amphorae in Britain and their date, see especially K. Dark, 'Western Britain in Late Antiquity', in F. K. Haarer et al (eds. ), AD 410: The History and Archaeology of Late and Post-­Roman Britain (London, 2014), pp. 23­–35, and also M. Duggan, 'Ceramic imports to Britain and the Atlantic Seaboard in the fifth century and beyond', Internet Archaeology, 41 (2016), online at https://doi.org/10.11141/ia.41.3 on recent finds of LR4 at Bantham, Devon, and on the Continent; see the University of Southampton's Roman Amphora: Digital Resource (ADS 2005) for further details of LR4 amphorae, which are 'common in major western ports from c. AD 400 to early seventh century' and are usually thought to have been primarily, but not exclusively, used for transporting the famous wines of Gaza in Late Antiquity. For the Wroxeter amphorae sherds, see P. Barker et al, The Baths Basilica Wroxeter: Excavations 1966–90 (London, 1997), pp. 120, 237; J. A. Riley, 'The coarse pottery from Berenice', in J. Lloyd (ed. ), Excavations at Sidi Khrebish, Benghazi (Berenice) II, supplement to Libya Antiqua, 5 (1979), 91–465 at p. 221; A. Hammon, 'Understanding the Romano-British–Early Medieval transition: a zooarchaeological perspective from Wroxeter (Viroconium Cornoviorum)', Britannia, 42 (2011), 275–305 at p. 293. It is perhaps worth noting that another sherd of a Palestinian amphora has recently been recovered from the Walbrook area of the Thames foreshore at London, adding to that known from the Billingsgate bath house at London, and has been assigned a fifth-century date on the PAS: LON-BB27D6. 4. A. J. Hammon, Late Romano-British – Early Medieval Socio-Economic and Cultural Change: Analysis of the Mammal and Bird Bone Assemblages from the Roman city of Viroconium Cornoviorum, Shropshire (University of Sheffield PhD Thesis, 2005), vol. 1, pp. 152–3, 162–3, 172; S. Bangert, 'Menas ampullae: a case study of long-distance contacts', in A. Harris (ed. ), Incipient Globalization? Long-Distance Contacts in the Sixth Century (Oxford, 2007), pp. 27–33. 5. O. Olesti et al, 'Controlling the Pyrenees: a macaque's burial from Late Antique Iulia Libica (Llívia, La Cerdanya, Spain)', in A. Sarantis & N. Christie (eds. ), War and Warfare in Late Antiquity: Current Perspectives (Leiden 2013), pp. 703–31. 6. F. Gerber & A. Baudry-Dautry, 'La mode de l’animal exotique dans la haute société gallo-romaine. Sépulture d’un singe dans la nécropole de la rue des Caillons à Poitiers', Archéopages, 35 (2012), 42–7; O. Olesti et al, 'Controlling the Pyrenees: a macaque's burial from Late Antique Iulia Libica (Llívia, La Cerdanya, Spain)', in A. Sarantis & N. Christie (eds. ), War and Warfare in Late Antiquity: Current Perspectives (Leiden 2013), pp. 703–31 at p. 714; G. Hodgson, 'A Barbary ape from the 1958–9 bypass excavations (Site 433)', in P. R. Wilson (ed. ), Cataractonium: Roman Catterick and its Hinterland. Excavations and Research, 1958-1997: Volume II (York, 2002), p. 415; A. J. Hammon, Late Romano-British – Early Medieval Socio-Economic and Cultural Change: Analysis of the Mammal and Bird Bone Assemblages from the Roman city of Viroconium Cornoviorum, Shropshire (University of Sheffield PhD Thesis, 2005), vol. 1, p. 152. 7. F. Gerber & A. Baudry-Dautry, 'La mode de l’animal exotique dans la haute société gallo-romaine. Sépulture d’un singe dans la nécropole de la rue des Caillons à Poitiers', Archéopages, 35 (2012), 42–7. 8. J. F. Bailey et al, 'Monkey business in Pompeii—unique find of a juvenile Barbary macaque skeleton in Pompeii identified using osteology and ancient DNA techniques', Molecular Biology and Evolution, 16 (1999), 1410–14; V. Onar et al, 'A bridge from Byzantium to modern day Istanbul: an overview of animal skeleton remains found during Metro and Marmaray excavations', Journal of the Faculty of Veterinary Medicine at Istanbul University, 39 (2013), 1–8 at p. 8; F. Gerber & A. Baudry-Dautry, 'La mode de l’animal exotique dans la haute société gallo-romaine. Sépulture d’un singe dans la nécropole de la rue des Caillons à Poitiers', Archéopages, 35 (2012), 42–7; and J. Schneider, 'The Manshead Archaeological Society 1951–1991', Bedfordshire Archaeology, 20 (1992), 96–104 at p. 102. 9. See, for example, I. Armit, Headhunting and the Body in Iron Age Europe (Cambridge, 2012), pp. 72–3; D. M. Waterman & C. J. Lynn (eds. ), Excavations at Navan Fort 1961-71, County Armagh (Belfast, 1997), pp. 120–4; K. A. Costa, 'Marketing archaeological heritage sites in Ireland', in Y. M. Rowan and U. Baram (eds. ), Marketing Heritage: Archaeology and the Consumption of the Past (Walnut Creek, 2004), pp. 69–92 at p. 73. 10. A. Pipe, ‘A note on exotic animals from medieval and post-medieval London’, Anthropozoologica, 16 (1992), 189–91 at p. 190; A. Hamlin and C. Lynn (eds. ), Pieces of the Past (Belfast, 1988), pp. 64–5; C. Platt & R. Coleman-Smith (eds. ), Excavations in Medieval Southampton 1953–1969 (Leicester, 1975), vol. 1, pp. 32, 334; M. Brisbane & E. Hambleton, 'A monkey's tale: the skull of a macaque found at Ryurik Gorodische during excavations in 2003', Medieval Archaeology, 51 (2007), 185–91 at pp. 189–90. 11. D. M. Waterman & C. J. Lynn (eds. ), Excavations at Navan Fort 1961-71, County Armagh (Belfast, 1997), pp. 120–4; M. Brisbane et al, 'An African monkey at the court of Novgorod princes', in The Origins of the Russian State (St Petersburg, 2007), pp. 74–81; M. Brisbane & E. Hambleton, 'A monkey's tale: the skull of a macaque found at Ryurik Gorodische during excavations in 2003', Medieval Archaeology, 51 (2007), 185–91. 12. See J. M. C. Toynbee, Animals in Roman Life and Art (London, 1973), pp. 56–60, for a survey of references to monkeys in classical literature and art, and K. Walker-Meikle, Medieval Pets (Woodbridge, 2012), pp. 13–4, and M. Brisbane & E. Hambleton, 'A monkey's tale: the skull of a macaque found at Ryurik Gorodische during excavations in 2003', Medieval Archaeology, 51 (2007), 185–91 at p. 190, for medieval documentary references. See also Widukind in the tenth century for a reference to 'monkeys' at the court of Otto I of Germany: H. Mayr-Harting, 'The church of Magdeburg: its trade and its town in the tenth and early eleventh centuries', in D. Abulafia et al (eds. ), Church and City, 1000–1500: Essays in Honour of Christopher Brooke (Cambridge, 1992), pp. 129–50 at p. 144. Charlemagne is likewise suggested to have kept monkeys in the late eighth century, and the menagerie of animals that accompanied Thomas Becket's mission to France in 1158 included apes: W. B. Clark, A Medieval Book of Beasts: The Second-family Bestiary (Woodbridge, 2006), pp. 17–18. 13. As noted above: A. J. Hammon, Late Romano-British – Early Medieval Socio-Economic and Cultural Change: Analysis of the Mammal and Bird Bone Assemblages from the Roman city of Viroconium Cornoviorum, Shropshire (University of Sheffield PhD Thesis, 2005), vol. 1, pp. 152–3, 172, and D. M. Waterman & C. J. Lynn (eds. ), Excavations at Navan Fort 1961-71, County Armagh (Belfast, 1997), p. 123. 14. The obvious comparison is again with camel remains—c. 50 sites in Europe have produced Roman-era camel remains, but only one of these is in Britain: C. R. Green, 'Were there camels in Roman Britain? A brief note on the nature and context of the London camel remains', blog post, 8 November 2017, online at http://www.caitlingreen.org/2017/11/were-there-camels-in-roman-britain.html. However, we might likewise note the lack of medieval parrot remains or, indeed, the almost total lack of Early Modern–Modern guinea pig remains from Britain, despite textual evidence for the presence of these species here then; see, for example, T. O'Connor, 'Animals in urban life in Medieval to Early Modern England', in U. Albarella et al (eds. ), The Oxford Handbook of Zooarchaeology (Oxford, 2017), pp. 214–29 at p. 222. Note also, perhaps, the presence of leopard and ostrich remains at Rome versus their absence from the Roman-era zooarchaeological record in Britain: M. MacKinnon, 'Supplying exotic animals for the Roman amphitheatre games: new reconstructions combining archaeological, ancient textual, historical and ethnographic data', Mouseion: Journal of the Classical Association of Canada, 6 (2006), 137–161 at pp. 154–5.